“A heritage runner bean with a unique difference. ‘Sunset’ has a rare peach/pink coloured flower rather than the usual red or white. A superb plant to grow not only in the veg garden, but in the flower border too. Growing to around 180cm (6’), the plants will provide you with masses of beans which taste fantastic. 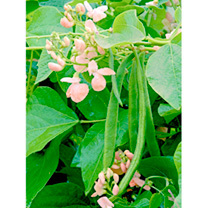 The beans can also be shelled and dried for use in casseroles during the winter months. Don’t forget that ‘Sunset’ flowers are edible and a great garnish to any food.” RHS Award of Garden Merit winner. Recent research suggests that evening watering of the roots increases pod set and subsequent cropping. Sow under cover in April for early crops, planting out in late May. For early crops sown outdoors, protect with fleece or cloches to warm the soil and protect the young plants. Sow outside 5–7.5cm (2–3") deep, spacing seeds 15cm (6") apart in double rows 45cm (18") apart. Allow a further 1.5m (5') between double rows. (Alternatively if space is limited, sow in circles and grow up canes in a ‘wigwam’ format.) Insert long cane supports or netting soon after germination/planting. Plants will reach a height of 1.8–2.1m (6–7'). Ideal for beds and borders. Prefers full sun or partial shade. Tasty, nutritious and easy to grow! Try varieties with different flower colours for a ‘wall of colour’.